Pre-Lock Security takes the security of your business very seriously, which is why we know how important it is for your to be able to get out of your building as it is to get in. We offer our business customers a free, no obligation security assessment of your exterior doors to insure each door of your premise is opening and closing properly. When you want to exit your building it's nice to know that Pre-Lock Security will make sure you do just that. It's easy, quick, and always safe. Our exit device hardware we sell is always the best in quality, selection, and service. 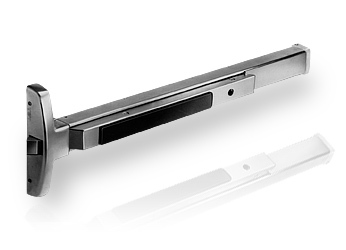 We represent many manufactures and carry the right exit device for every door in your builiding. We have the Heavy Duty exit devices for doors that get a lot of action and the Standard Duty devices that always comply to the ADA American Disabilities Act providing you with durability, toughness, and safety all the time. All the products and manufcatures we carry are also up to par with our well known flexibility and wide range selection, readily available in several finishes, mounting styles, door widths, and trim options. From Lever Escutcheon Trim for a field-friendly handing solution to Pull Trims for a more traditional appearance, Pre-lock knows that looks are also very important thus our product line offersings are both complimentary and versatile, once again proving that Pre-Lock Security gives you what you want and when you want it. With years of experience dealing with our business customer's needs, you can always rely on Pre-Lock Security to provide you with a professional and confidential commercial locskmith service.